100% Durable Lightweight No-See-Um Fine (approx.625 holes per sq. inch) Polyester Netting. Designed to protect even against the smallest insects. Has a cross-stitch which prevents it from stretching. Best Chemical-Free protection against biting and stinging insects, such as: mosquitoes, gnats, no-see-ums, spiders, ants, etc is achieved by combining the use of no-see-um netting with absolutely natural "Buzz Free Zone" personal spray (see at the bottom of this page!!!). NEW!!! Off-white (not dyed) no-see-um netting is available upon request!!! Available in untreated white, white, light tan, slate grey, olive green and black colors. Netting is available by the yard, 5 yard, 10 yard packages and value packs of 10 sheets 20" wide x 4 yards. Rolls of 300 yards are available for sale upon request. Custom cut and sewing are available upon request. Custom cut for over 15 yards or more. 100% soft sheer polyester (156 holes per sq. inch) netting. Chemical-Free protection against biting and stinging insects, such as: mosquitoes, gnats, spiders, ants, etc. Available in white, black, ivory and sand. Other colors such as red wine, mauve, pink, purple, smoke blue and lavender are available upon request with the minimum purchase of 100 yards. Netting is available by the yard, 5 yard, 10 yard packages and rolls of 200 yards. 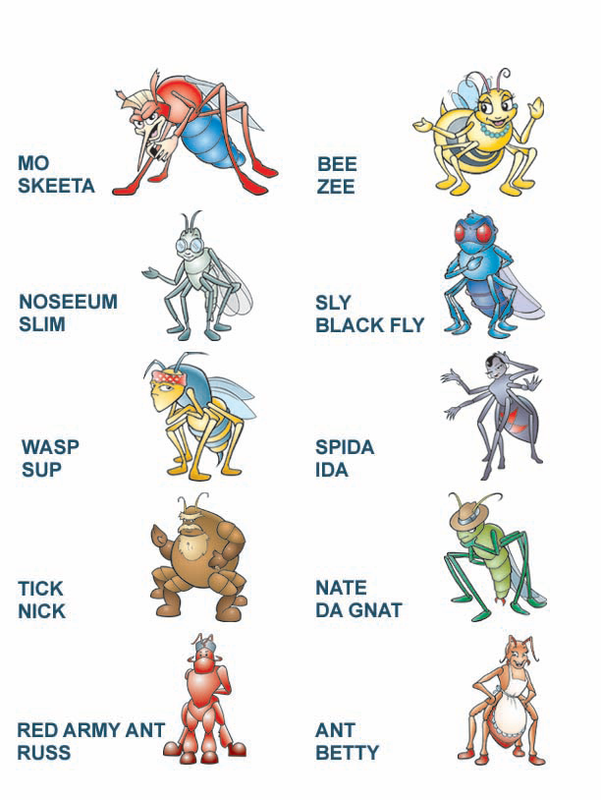 The THUG BUGS are Insect Action Figures that will be taking on the world by swarm! Get your original first edition collectible stickers today!